TERADATA UNIVERSE CONFERENCE, NICE, FRANCE – April 3, 2017 – Teradata (NYSE: TDC), the leading data and analytics company, today announced an all-memory update to its flagship Teradata IntelliFlex™ platform that delivers extreme performance and storage density in a single, ultra-efficient cabinet. The upgrades are empowered by a move to all solid state drives (SSD), which make it possible to reduce required data center space while delivering a massive increase in processing power for mission-critical analytics at the speed-of-thought. 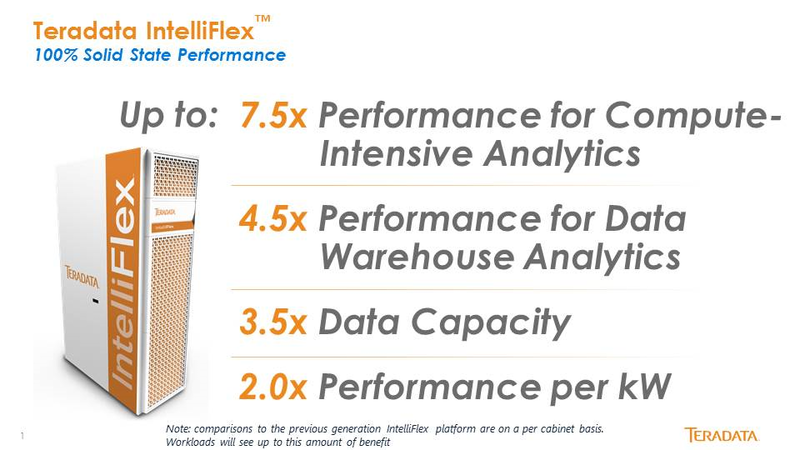 Teradata also announced the new, ready-to-run Teradata IntelliBase™ platform – revolutionary in its single cabinet support for multiple software technologies, re-deployable hardware, and low, commodity hardware price-point.